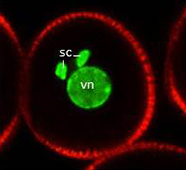 An Arabidopsis pollen grain (male gametophyte) with a large vegetative cell (wall shown in red) containing a vegetative cell nucleus (vn) and two sperm cell nuclei (sn) labeled with a histone-GFP fusion protein. Like in animals, sexual reproduction in flowering plants relies upon the production of male (sperm) and female (eggs) gametes and their fusion upon fertilization. Despite the importance of plant fertility for seed production and agricultural productivity, relatively little is known about the molecular processes underlying gamete development and function. Work in my lab is focused on using genetic and molecular approaches to understand key stages of male gametophyte (pollen) and sperm cell development. Polyploidy, the presence of more than two sets of chromosomes, has had a major impact upon the evolution of plants and the development of modern agricultural crop varieties. The major mechanism of polyploid formation is believed to be through the production of gametes that have not had their ploidy level reduced during meiosis and are thus termed unreduced. We use a mutant, called jason, in the model plant Arabidopsis thaliana to investigate how unreduced gametes form. We have found that cytoplasmic organisation is essential in preventing unreduced male gamete formation. In particular, a band of organelle that forms across the middle of meiotic cells during the second division is important as it provides a physical barrier to keep the two meiotic spindles separated. We are now investigating how the molecular function of the JASON protein to determine how it impacts upon cytoplasmic organisation. In flowering plants the male germ line is not formed until late in development when a haploid microspore undergoes a highly asymmetric division. This forms a large vegetative cell and a smaller germ cell, which represents the start of the male germ line. During germ-line development the germ cells is engulfed within the cytoplasm of the vegetative cell where it expresses the proteins required for sperm cell function and undergoes a single mitotic division. We are interested in how the asymmetric division specifies the male germ line, largely by investigating the regulation of the key germ-line transcription factor DUO1. Brownfield, L., Doblin, M. A., Fincher, G. B., & Bacic, A. (2009). Biochemical and molecular properties of biosynthetic enzymes for (1,3)-ß-glucans in embryophytes, chlorophytes and rhodophytes. In A. Bacic, G. B. Fincher & B. A. Stone (Eds. ), Chemistry, biochemistry, and biology of (1→3)-β-glucans and related polysaccharides. (pp. 283-326). Burlington, MA: Academic Press. Brownfield, L., & Twell, D. (2009). A dynamic DUO of regulatory proteins coordinates gamete specification and germ cell mitosis in the angiosperm male germline [Article addendum]. Plant Signaling & Behavior, 4(12), 1159-1162.